Leadenhall Market is a Victorian delight, tucked away in the centre of the old City of London, off Leadenhall Street. 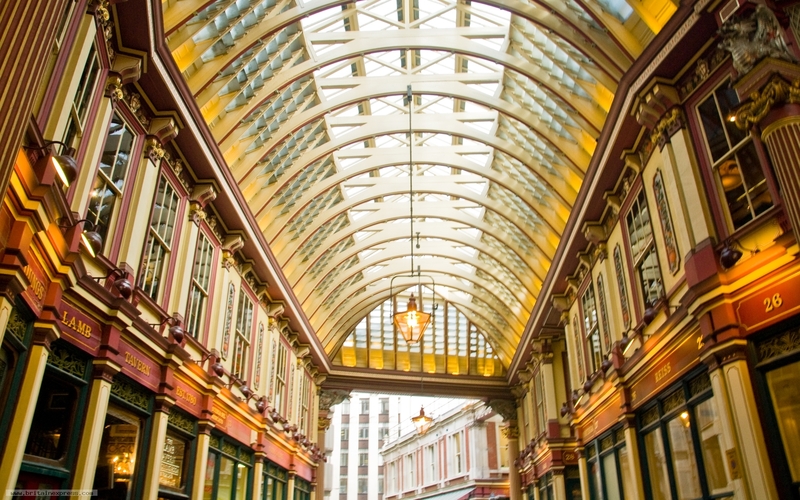 There was a market at Leadenhall at least as early as the 14th century, but the market as we see it today dates from 1881. It was designed by Sir Horace Jones, who was also responsible for Billingsgate and Smithfield markets. The inside of the market is an absolute delight, all painted in reds, greens, and yellows, and lit by skylights above. It was a bit dim inside the market compared to outside, as you might expect, but I just leaned against a wall to steady my camera and took this shot.